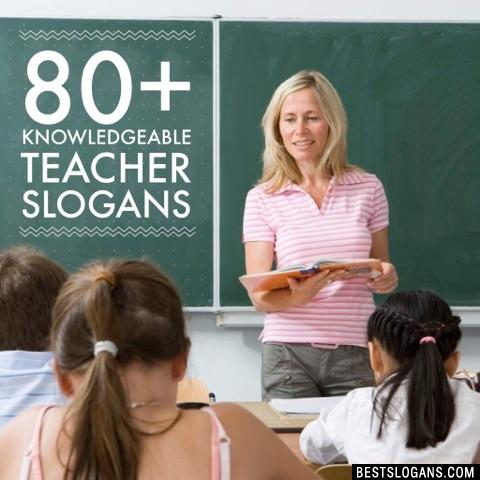 80 new entries added to teacher slogans, teachers day slogans, teacher appreciation week slogans, that include pictures. 1. A good teacher can inspire hope, ignite the imagination, and instill a love of learning. 1 A good teacher can inspire hope, ignite the imagination, and instill a love of learning. 2 A Teacher presents the past, reveals the present, and creates the future. 4 Teacher: Being one is the highest privilege. Having one is the best blessing. 5 Good teacher and good education has no substitute. 6 Thanks for making many successful lives on the earth. 7 Thanks for lighting the way of my life. 8 Teachers prepare healthy crop for future from any seed. 9 Teachers have much patience to shape little minds. 10 It is teachers who create many opportunities in our life. 11 Teachers fill our mind with positive thoughts and body with energy. 12 It is teachers who take us out of darkness to lead in light of knowledge. 13 A teacher is one who clears all questions and negative points in our mind. 14 Professional efforts of teachers have ability to change the fate. 15 Teachers have true patience while teaching students. 16 Teachers know well the art of teaching. 17 Teachers influential personality always influences the students. 18 Teachers have power to bring development revolution in the country. 19 Teachers change our life through education. 20 Teachers teachings help us to fight challenges in life. Can you think of a good Teacher Slogans we're missing? Or come up with a clever one of your own. Please share below.